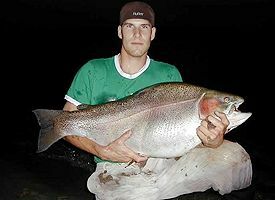 World Record Rainbow Trout -- 42 lbs. 6 oz. 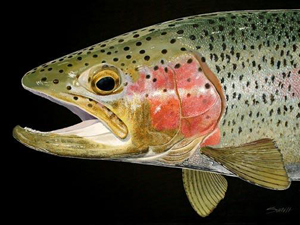 The rainbow trout is SO west coast and is native to North American rivers, lakes and waterways west of the Rockies. Anyone who fly fishes for them on the east coast of America can find them in abundance as well. But they were introduced to rivers and streams east of the Rockies and are not considered to be native to the east coast. They tend to prosper in waters that stay near the temperature of 12 degrees Celsius in the summer. Usually, the waters they inhabit are oxygen rich, clear as daylight, and have a gravel or rock bottom. Rainbows remain in fresh water for the duration of their life, which is about 4 to 6 years, but have been known to reach 12 years of age. They reach sexual maturity between the ages of 1 to 2 years and can weigh as much as 8 pounds (larger ones have been reported -- the world record Rainbow was broken twice in 2008 and now sits at 43.6 lbs.). Just like humans, the girls mature faster than us boys. Rainbows get a little frisky from March to August, because that's when they spawn. The females lay eggs in several nests called redds. Each nest will hold up to 1000 eggs. Talk about fertile females! The eggs will hatch in about 4 to 6 weeks time. As a hatchling, the rainbow trout will eat plankton. As they mature, the diet is comprised of insects, small crustaceans and other aquatics like freshwater shrimp (scuds). The rainbow trout has been seen to eat other fish as well, making them a bit of a cannibal. Rainbows are a tasty addition to the dinner plate. The meat is a flaky, white moist texture with a bit of a sweetness to it. Recipes abound for the preparation of our rainbow. The most popular one is the stuffed trout, which is served whole (head and all so it can watch you eat it) with the hollowed out body filled with cornbread stuffing. Basically, rainbows can be pan fried, broiled or baked. Butter is a must to keep the meat moist and fluffy, with a little wine (white works nicely) for flavoring. Eat them with a bit of fresh lemon for a taste treat you won't soon forget. These delicious aquatic treats need to be prepared fresh within about 24 hours of catch for optimum quality. If you need to hold them longer than that, pack the body with ice and keep them ON a bed of ice wrapped in foil. To keep them for an extended period of time, freezing works wonders. 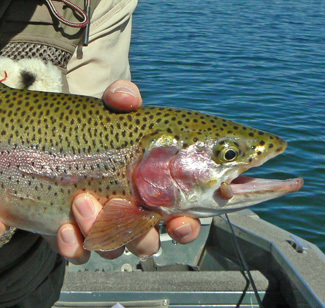 Rainbow trout are also called redbands due to the noticeable red stripe running along the sides. 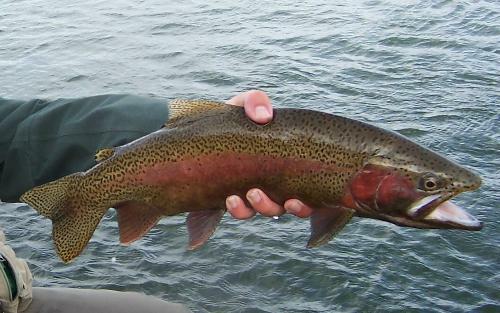 Actually, there is a band of colors on both sides that resemble a pretty, pretty, rainbow, hence the name rainbow trout. The freshwater habitat keeps the colors vibrant and sharp. Rainbows are very similar to steelheads in appearance. The main differences are that the steelhead migrates to the open sea for periods of time. The salt water fades the side stripes leaving the steelhead looking metallic silver in color. Other than the ocean migration and the stripes, these are the same fish and either one can be enjoyed with some wine and vegetables on the side. For further information, please CONTACT US or visit our < B>.